Drilling mud agitation is necessary for effective drilled solids removal, complete mixing, maintaining fluid homogeneity, and prevention of barite settling in weighted mud. 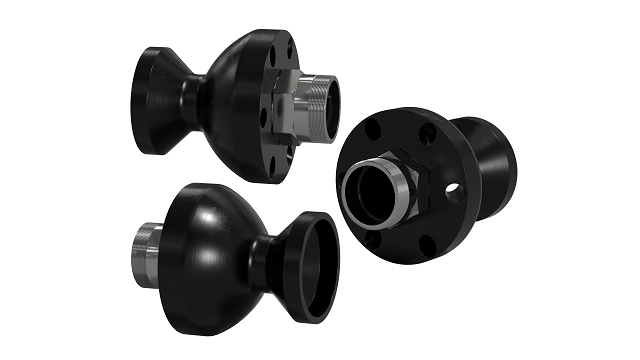 Proper agitation of heavy mud is commonly achieved with traditional paddle style agitators or mud gun nozzles such as Alfa Laval Vortex Radial Eductors. However, in light-weight drilling mud applications with little to no barite, solids settling prevention is less of a factor than non-mechanically shearing the mud to maximize the reactivity of additives such as bentonite and various polymers. The Alfa Laval Vortex PS Radial Eductor provides a great solution for common mud agitation, with the added benefit ofdynamic fluid shearing that cannot be achieved with traditional paddle agitators or mud guns. A simple manifold arrangement using Radial Eductors installed in mud pits or transport vessels of any configuration can solve the problems of stratification and solids settlement - while helping to achieve the most enhanced fluid properties from reactive drilling mud additives in the shortest time possible through dynamic shearing. Getting the most out of reactive drilling mud additives as quickly as possible not only has an immediate savings impact on drilling fluid chemicals, but also prevents the costly, time consuming, seesaw battle between fluid overtreatment and base fluid dilution. The Alfa Laval Vortex PS Radial Eductor is a tank mixing eductor specifically designed for dynamically shearing drilling mud and suspending drilling fluids uniformly without stratification and settling. It has no moving parts, and generates strong turbulent plumes in drilling mud pits, providing the energy distribution needed to keep them uniformly mixed and solids suspended. Applications for the Alfa Laval Vortex PS Radial Eductor include transporting drilling fluids, storage tanks, chemical and slurry tanks, mixing liquids and stabilizing emulsions. The standard unit consists of a uniquely designed body molded from high density, abrasion resistant polyurethane. 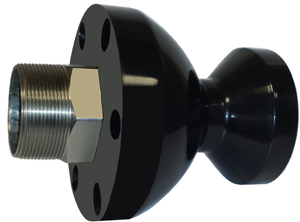 A stainless steel female NPT connection is fused to the polyurethane body during the molding process. The unit also features the patented Lobestar Mixing Nozzle®. In a typical application, one or more PS Radial Eductors are mounted on a piping manifold system inside of a pit or other type of vessel. The number and size of eductors required for a specific application is dependent on the vessel size and type of fluid. Performance is based on the Bernoulli principle, which states that high velocity equals low pressure. Pressurized fluid is pumped through the Alfa Laval Vortex PS Radial Eductor’s unique Lobestar Mixing Nozzle®, creating a high velocity stream and low pressure area inside the eductor body. The resulting jet pump effect draws additional surrounding fluid into the eductor body through peripheral suction ports. The converging fluid treams are dynamically sheared by the nozzle inside the eductor’s venturi throat and discharged into the mud pit or vessel as a far-reaching, high-energy plume with flowrates at least twice those of standard jet nozzles. In most drilling mud applications, multiple PS Radial Eductors are strategically positioned inside tanks to provide maximum fluid shearing action and plume coverage. This eliminates dead spots with no fluid movement, increases total fluid volume movement, and keeps solids from settling.